They were placed on 800 buses and in the next few weeks, another 1000 advertisements will be placed in the subways systems in and around London. Question: What do you think ? 2. I find it funny that “atheiests” are identified by an opposition to the belief of God. It’s a reactive belief system. To atheists: What is your purpose? 3. Conversation. They’ve invested tons of money on these advertisements and frankly, it’s probably been the greatest recent catalyst for conversation about God for many people and churches. It’s like free advertisement for theists and Christians. That’s a bit extreme, she thought, as well as hard to prove. “If I wanted to run a bus ad saying ‘Beware — there is a giant lion from London Zoo on the loose!’ or ‘The “bits” in orange juice aren’t orange but plastic — don’t drink them or you’ll die!’ I think I might be asked to show my working and back up my claims,” Sherine wrote in a commentary on the Web site of The Guardian. But something seized people’s imagination. Supported by the scientist and author Richard Dawkins, the philosopher A. C. Grayling and the British Humanist Association, among others, the campaign raised nearly $150,000 in four days. Now it has more than $200,000, and last Wednesday it unveiled its advertisements on 800 buses across Britain. In 2003, when an interviewer asked Tony Blair, then the prime minister, about religion, his spokesman, Alastair Campbell, interjected, snapping, “We don’t do God.” After leaving office, Blair became a Roman Catholic. Still, since Sept. 11, 2001, religion has played an ever more important role in public discussions, said Dawkins, the best-selling author of “The God Delusion,” with the government increasingly seeking religious viewpoints and Anglican bishops still having the automatic right to sit in the House of Lords. 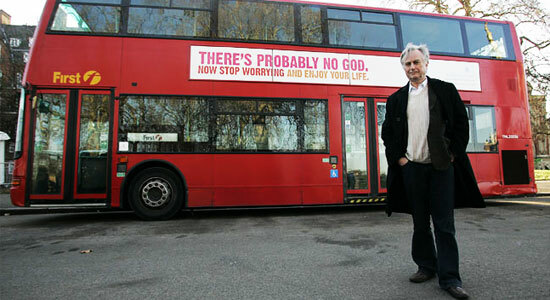 An interesting element of the bus slogan is the word “probably,” which would seem to be more suited to an Agnostic Bus Campaign than to an atheist one. Dawkins, for one, argued that the word should not be there at all. For religious people, advertisements saying there is no God “would have been misleading,” Bleakley said. i like it. also, we need double decker buses here. Christians can benefit from the second line, which is one of the messages of Ecclesiastes! The existence of these billboards presumes a comfortable, middle-class Christianity that is characterized predominantly by us sitting around worrying about personal sin. Dawkins always irks me with his smugness, but can you imagine how crass those billboards would look to a Christian in Haiti or Zimbabwe? Stop worrying, Christians, everything is fine! Atheists in general have poor PR, and I guess this billboard doesn’t help. After all, there was a sub-movement by a few atheist thinkers to call themselves “Brights” instead. I guess I’ll have to settle for being a “Dim”. Haha. But I agree that as Christians, we shouldn’t taken for granted our beliefs or presence in the world. If we really have faith in the Truth, we shouldn’t be afraid to engage in conversations with people who think otherwise. I always wonder why anyone would want to deprive anyone else of their faith. It’s a fundamentally destructive act. Turning someone on to the truth is a good thing. What can be achieved by turning someone on to doubt? At the very least it’s extremely tacky. For me the word “probably” renders the campaign totally unthreatening. Instead of its intended atheist message, it advocates a hedonistic agnosticism, which unless one has encountered God, seems like a respectable intellectual position. @gar, if anyone ever says that to you, ask them how many people they know who say “When I became a Christian, it was like the lights went out, everything went out of focus and I found nothing made sense”. Or indeed, how many people can honestly say adopting Atheism was like “the lights coming on, everything moving into focus, and now everything makes more sense”. They might want to claim intellectual brightness, but the conclussion generally is that finding God = light turns on, losing God = light turning out. Again with the whole tagline about worry and happiness. Its really a very destructive form of heddonism, and one muchly reflected in our economic system, that informs these sentiments I feel. The only way in which God causes me more worry is the placing on my heart of injustices from the community and wider world. Only fools say there is no God (Psalm 14:1). Why argue with fools and be threatened by them? Now seriously, this is mainly a western problem. The Maoist government in Nepal declared Christmas as a national holiday in Nepal last year for the first time in its history after decades of persecution! The Prime Minister and President even sent greetings to Christians and the churches as they celebrated Christmas. I don’t think people who think ads like these are persecution of the faith have really been persecuted before. In the darkest times of the history of the church in Nepal, the Christians are not silenced by their fear of persecution or insecurity even though they were only a very small minority then. Now there are more than 400 churches in Nepal, the largest of which is about 10,000 members! If we are threatened by slogans or ad campaigns, our faith is nothing! Hm. I’m not a fan of Richard Dawkins in general – even among atheists he strikes me as particularly bellicose and reactionary – but I think you have some good points here, Eugene. This isn’t really anything by which we should be offended, but at the same time I have to ask, can we have grounds for a conversation here? Do these advertisements really provide such grounds? The conversation of whether or not there is a God doesn’t really strike me as an interesting one, as it usually just leads to an impasse, a clash of narratives. Dawkins, Hitchens, Harris and Maher all seem to be working out of what Charles Taylor calls the ‘epistemic narrative’: the idea that since the Scientific Revolution and the Enlightenment the knowledge afforded to us by the scientific method has been steadily replacing religious superstitions with conflicting epistemic claims, and ultimately will (or already has) replaced the superstition of a belief in God. On some level, they are right about the kinds of progress we have made with the scientific method, but religious people ought to be (and many are!) equally capable of dealing with scientific data and accepting models afforded to us by our best natural sciences – at a deeper level, they’re kind of missing the point! I don’t think we see ourselves as making a claim that is necessarily and primarily epistemic – we aren’t looking for God in scientific proof. This might be the Kierkegaardian existentialist in me coming out, but I’m convinced that a Christian faith resting on an epistemic claim or logical proof of the existence of God is not any kind of faith worth having, as it says nothing about the relationship with God through Christ that we want to have. Our narrative is different. This comes out in some of the conversations that I have had with atheists – they want to say that my believing in a personal God is an epistemic claim for which I have no proof, and I respond that it doesn’t matter that I don’t have proof, because that isn’t really the point. I keep having to draw the distinction between fact and truth, between evidence and meaning, but that’s not a distinction that many of the more vocal atheists are willing to accept. I do definitely hope we get to the point where we are able to have a meaningful public dialogue about these kinds of narratives, but at this point I’m not sure the groundwork is really there. Dawkins is on record as having preferred something stronger than probably. But in a typical display of British moderation “probably” was preferred. I agree with you, Eugene, but am also happy that probably was chosen. It allows easy conversation. Its good for us to have to answer for what we believe in a low key way. I think that is hot. Mary and I are in London right now (for the next 3 months). Just saw a couple of these ads today. Eguene I have to agree with you on the larger marketplace thing. Often times I feel that living in the United States has left many of us Christians feeling a bit relaxed and well normal. We forget how big the world is that we are supposed to be sharing with. I mean really, how normal are we? Recall back in Dec atheists in WA set out their own sign in Olympia: http://www.cnn.com/2008/LIVING/12/05/atheists.christmas/index.html?iref=newssearch. I’m all for the open marketplace discussion. So in that spirit, I find the assumptions of the ad kind of funny. I never realized that my belief in God was a source of worry and a barrier to me enjoying my life. In fact, I’ve found it to be quite the opposite. And I agree with Brian K–it seems to me that the underlying assumptions would be even more laughable to believers among oppressed peoples. Well atheists do have a voice and an opinion. After all, atheists make up more of the population than African Americans and hence many other minority groups/races. And just look at all the ideologies, laws and policies those small groups/races have established to maintain their beliefs, worth or value. So no its not a shock or offensive, its just an expression. Opinions will never stopped the out pouring of God’s Spirit on His people. YOU WILL BE HELD ACCOUNTABLE ! Not much – but it has haunted me for ever….. I think that we (as christians) have represented God/Christianity/Jesus as threatening (“if you don’t do the right thing” or “become a believer” etc) . I know at times (even though I didn’t want to say it out loud) I have been overwhelmed with a feeling of failure and hopelessness when it comes to Christianity. I also think that we have not done a good job of representing Christianity as being a life that is enjoyed. Hence the message of the ad. In my point of view, the message is clear. There may be God or may be not who has seen it? Don’t fight eachother in the name of God and dont make it reason for death of thousands of innocent people because if there is God then no God wants this what is happening in this world today. Nowhere is safe and no one is safe. So forget what had happened before and lets forgive eachother and live your life and let others to live their. I know how it feels when we loose someone so dear to us but then if we start taking revange, then this war will never finish. If there is God: Allaha, Krishna, Buddha, Christ or by whichever name you know your god(?? ), I don’t think he wants this fight. No god, No religion and no man wants this war. Please don’t fight. Lets forgive eachother and lets live our life and let others to live their life. Lets come together and talk, there are millions of people who have billions and billions of dollors but there are millions of people dying without food and water. I am ordinary person. Nither I writer nor I am very educated person, so sometime i think I am ok whatever I am. I’ve been following the progress of this campaign for some time and in fact was just recounting to a friend yesterday how they raised so much more than it had set out to. Mostly because Dawkins got behind it, I gather. I wholeheartedly agree with the reasons you outline here about why this is a good thing. I too do not enjoy living in a context dominated by a ‘christianese subculture’. I drive myself crazy wondering whether my Christian practice is a function of the culture I find myself in or an offshoot of my belief. It’s just the way I get sometimes. I think the idea of someone tossing back this kind of challenge makes me stop and ask myself the right kind of questions. I can’t think why, now, but for the life of me I’d never noticed that what Atheists ascribe to is a negative belief system which means that their existence is wholly dependent on the existence of belief in God, else they’re irrelevant. That’s the oddest. Must go turn that over in my head and stare at it from every possible angle. And of course, conversations, conversations conversations. Here’s one, already. I look forward to countless more. It is interesting though, that the idea that there is a God should be associated with worry. I know what they mean is that there is probably no God so there’s probably no one to condemn you to hell so quite worrying about how the here and now is going to impact on you in the long run. Or something like it. It makes me wonder whether we have not misused the message of eternal condemnation. Which is not in any way to suggest rewriting the Bible. I wrote year before last, a post titled God is Not Yet Dead which comes to mind now as it was about the sudden proliferation of books prematurely declaring God’s death. In the interest of full disclosure, though, unlike Bo, I was none too pleased with Matthew Parris’ atheistic pronunciation either. But that’s just me. Ahem… I meant quit worrying rather than quite worrying. I actually rather enjoy living in an area dominated by a Christian-esque culture. It is no less challenging to live as a believer and indeed sharpens the lines more than you might imagine. When all around you the dominant assumptions are Christian, then you realize that holiness and godliness are really more than just being nice people. The believers I’ve been fortunate to interact with from more “secularized” cultural contexts often tend to have a smug libertine approach to life where much of the decadence and ungodliness of their lives goes unchallenged because by comparison to the thoroughgoing hedonism around them, they are doing quite well. Pulling that off is much more difficult in a context where “everyone” is a Christian (though of course everyone is not). Evangelism for instance is very difficult because almost everyone agrees at some level with the basic tenets of the Christian faith and those who do not, at least pretend a polite toleration. Who cares about the ads? They are no more of interest to me than any number of visual litter that contaminates the world. I’ve got a slightly different take. I’m mostly interested in the wording of these ads. If the best way to write Christianity/religion off is to say “don’t worry about it, it’s probably not true”, to what extent are we really bringing “good news” in the gospel we preach. It seems to me that if we were really preaching “gospel”, then attacks from atheists would look more like “you’re being scammed” or at least “look at what you’re missing out on”. I can not lie, the sign upsets me in some ways. I do not have anger towards those who put it up, but I think it dishonors God. Obviously, we can not expect athiests to honor God, but I think it really mocks the idea that there is a God, and that if there is a God it is of little importance anyways. That is the part that upsets me. I really think this sign speaks to a Christianity that for many is boring, it looks boring from the outside and is boring on the inside. Its watered down and it lacks passion and urgency. I think there is a message… if you are a Christian, why do you appear so worried?? (Matt 6:25-28) Shouldn’t we be the least worried people out there…. Also, is it really the first duty of practising Christians to be ‘holier’ or ‘godlier’ than the culture around them? As I recall from the Scriptures, that was the pretension of the Pharisees, who had an exclusive table-fellowship, corban customs and cleanliness codes that not all people could afford to live by. We’re all imperfect people, and we are all shaped to some extent by the culture we live in – that is a part of our sinful inheritance as sons and daughters of Adam. Our witness should not call us to condemn and withdraw from the culture (like the Essenes, for example), but rather to engage it with the message of radical and persistent hope with which we have been charged, no? I agree that we should resist wasteful and hedonistic tendencies where we find them, but shouldn’t we be mindful that Jesus did not call his followers to an exclusive or reclusive asceticism, but toward an active, radically inclusive engagement in the community? God knows full well that I hear enough about personal piety in the sermons preached from the pulpit of my church out here on the East Coast – that’s one of the reasons I come here to read Eugene’s work! It’s really quite a breath of fresh air. When I first heard about this campaign, I just howled with laughter. They are so funny! What else can you do? This sign proves once again that the Western world is in actuality a post Christian one. I can see it everyday in Manhattan where I live, and the only churches that thrive are those that preach the gospel in a post-Christian, and postmodern context. As to athietsts existing soley to negate Christianity…I disagree. Many athiests I met, mostly bright young college students, are interested in Christianity but disagree with the exclusive nature of it, the way the Church behaves, and the whole “mankind needs God” deal. Sure, there are some who are very antagonistic to Christianity, but they are so because they want to live life the way they want to. I think we must remember what Paul said, “For the message of the cross is foolishness to those who are perishing”. thanks for this post and for the article. i agree, we need not be threatened by contrary thoughts within the marketplace of ideas. there, outside the christian bubble, the truth must be visible & incarnational. deeper than some sort of christian bumper sticker or a even sunday sermon? In any event, to answer your question, yes, absolutely, the first duty of Christians is to be holy; to authentically be the people of God has always meant being holy, personally and corporately and thus to “shew forth the praises of him who has called us out of darkness into light.” I agree that all too often this calling is reduced to personal piety, or even more egregiously, to a neutered niceness that passes for Christian witness, but is certainly much less than that. When I speak of holiness and godliness, I mean much more than reclusive asceticism. Holiness and godliness has always meant much more than that, and arguably was never intended to be reclusive at all. As to your comments about living in a “non-Christian-esque part of the world,” I will simply say that I agree with you. My comments were directed more towards the context of the United States where there is religious liberty and a lack of government compulsion related to religious matters. To live in a country without such freedom or where Christians are actively persecuted certainly requires a different kind of practice of Christianity. Such believers need our prayers and our support. My issue with Dawkins is his extreme self-importance, and his arrogance in his opinions; he actually does what he accuses the faithful of-stating something is true without “proof.” If his argument is that you can not prove that there is a GOD, then equally how can you prove that there is not one. He also ignores the basic tenet of faith-belief without “proof.” And why is Mr. Dawkins so determined to prove that he is “right” and mar the faith of others? I mean really, what business is it of his? I sometimes feel like he thought process is “If I can’t have faith in something, then no one can!” Yet I am completely sure that Mr. Dawkins believes in many things that he has neither sen nor experienced the “proof” of-while I am stretching it here, and sounding a bit off, but in reality you could argue with him many scientific facts-has he ever been to the moon? Has he ever seen an atom be split? Obviously I am being kind of silly, but the point is that so much of what we believe about our material world is based on supposition and “faith” in science, but yet state that you believe in something greater, and you are cast a fool. elderj – Thanks for clarifying that; I think I was misinterpreting you somewhat on the concepts of ‘holiness’ and ‘godliness’ – the two constructions that I most often see of this, sadly, are the banal liberal ‘I’m okay; you’re okay’ and the banal conservative ‘I’m okay and you’re not’. I agree with you wholeheartedly that there is far more to the Christian life and the Christian experiential narrative than simply being pious and a ‘nice person’. I have to say, though, that I approve of the liberation-theological emphasis on a return to orthopraxis-as-witness: evangelism by direct social action and social justice work can be as powerful as traditional evangelism; in my opinion, even more so in modern American society. Anyway, thanks for your thoughts. I enjoy hearing your perspectives on these issues as well. Well I am not an atheist (nor am I a Christian) but I don’t think atheism is a negative belief system – that would be anti- theism. Technically, a-theist is without God. The belief system would not consider God within it’s framework at all. It is a completely different narrative than the Christian one and I would imagine many Christians can not truly grasp a belief system “without God”, thus is appears to be anti-God to those within the Christian narrative. However, that said, we do live in a theistic world and atheists do react to that….and I’m sure many are also anti-theists in addition to being a-theists. Whatever purpose was the add for n however u took it, message is simple – “Don’t fight in the name of religion, live your life n let others to live theirs.” – this is how i took it. I am sick n tired of this advocation n justification of religion. U know what its all rubbish. Why do u think u r great n u know everything !!! then u teach n preach that god said this n god said that ……………..actually u don’t know what god said. Pleaase open you eyes, God, Allah, Krishna, Buddha……..never say fight, but said forgive. All u stuppid followers u have mistaken it. Please Please dont fight !! Don’t write anything that escallate this violence more. All the god said “Win your enemies heart by love”. We r not god n we cant b god. So….. I really been waited for this many years ago. finally I can see now , wich is very good to tell people this good news. I was muslim and I found nothing good about allah and his messenger its all bullshet . he is right there is no god so injoy your life there is not any other life after death . I can promes you allah is not exist its hole a big lie. Very interesting advertisement. I mean, it is sad – no question about it. The LAST thing that we should be doing is telling people that there is no God. But, at the same time, I understand the logic / purpose of the advertisement. All I’m saying is that the message of “peace” could have been communicated in another way. I love it! And couldn’t agree with you more. The sense of entitlement some Christians carry around makes me want to throw up sometimes and laugh out loud others. Chill out brothers and sisters. Chill out. I find it funny that “atheiests” are identified by an opposition to the belief of God. It’s a reactive belief system. To atheists: What is your purpose? It seems like you’re trying to start a serious discussion by this thread, so I’d like to answer in kind. To address the first sentence…the term “atheist” is actually one which many of us who do not believe in a god dislike, as well. It does, indeed, define ourselves on religious terms, is reactionary, and frankly is a poor term to describe us. I could plead that the term has been foisted on us by people of faith as a derogatory term, but that doesn’t mean we’ve had any success coming up with a better moniker. Many people such as myself believe there is no supreme entity, but more to the point, we place our trust (I am reluctant to use the term “faith”) in the remarkable powers of science, reason, and the natural tendency of most human beings to want to improve themselves and their world. As comedian Julia Sweeney put it, we prefer to think of ourselves as naturalists. We believe in the natural world that we can see and experience, including those fields of science which require formula and sophisticated instruments to make known. What is our purpose? To make people aware that these ways of looking at the world are all we need. There is a certain fatalism in some of us when we think about the fact that this is the only life we have. But in a way, it’s also motivating–this is our only shot to get it as right as flawed beings can. It also takes away any excuses that the radicals in religion use to justify atrocities against their enemies because they will be rewarded in the next life. And I know that many religions believe there will be eternal punishment for those who pervert the “true faith,” but no matter: religious fanaticism is simply justifying one’s own bigotry and bias through the God Filter. The non-believers don’t make excuses for ourselves or for others. We hold people accountable. @ Brian Kendall: “Dawkins always irks me with his smugness…” Now you know how we feel about Pat Robertson, Jerry Fallwell, Rick Warren, Mike Huckabee, George W. Bush…you get the idea. @ Paul L- Fantastic. Thank you. Oh, and btw, great post. I’ll restrain myself from ranting. 1) We are concerned about the isolation of certain atheist persons who are surrounded by religious family and community and think they are alone in the world. The main aim of the different atheist bus campaigns is to reach out to them and let them know they are not alone. 2) There are a lot of really rotten and/or violent things done in the name of religion, from flying planes into buildings to teaching kids that they deserve hell. For the religious who have been traumatized by religion, we want to show that there is an alternative. 3) And to just start conversations with good, well meaning theists like yourselves!